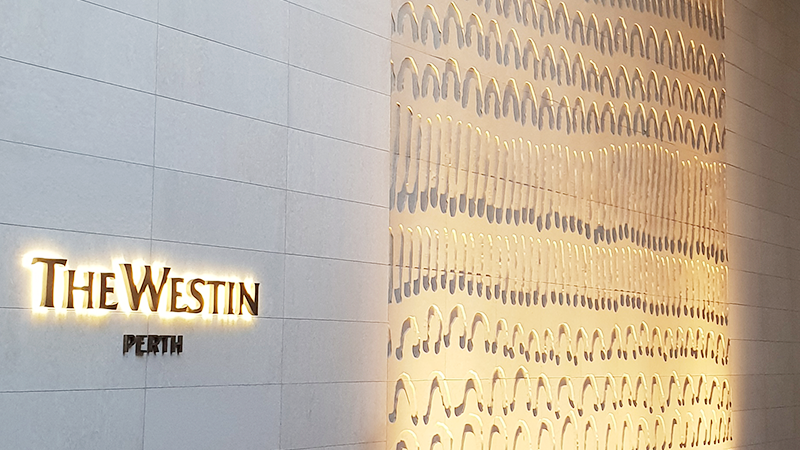 Even though the Australian hotel, “The Westin Perth”, which could be used as an art gallery, is more than 14.300 Km far from Alicante, it has been constructed with the Spanish Natural Stone from Bateig. The city of Perth has become a very well-known high-end tourist destination during the last few years. Art and culture are very well founded and there are several places dedicated to them. Since the very beginning of the architectural Project of The Westin Perth, whose contractor was BPI Group, art was a fundamental component for the hotel complex. The purpose was to highlight the unique personality and essence of Perth and the Western Australia by using different artistic pieces. In order to reproduce these concepts, the well-known architectural studio of Melbourne (Australia), Bar studio, was chosen and Stewart Robertson became responsible for this project. Within the collection of art works which can be founded inside of this hotel, art is mainly present through sculpture and painting. The natural stone Bateig was used in many of the pieces as the ideal base where different artists could project their vision. 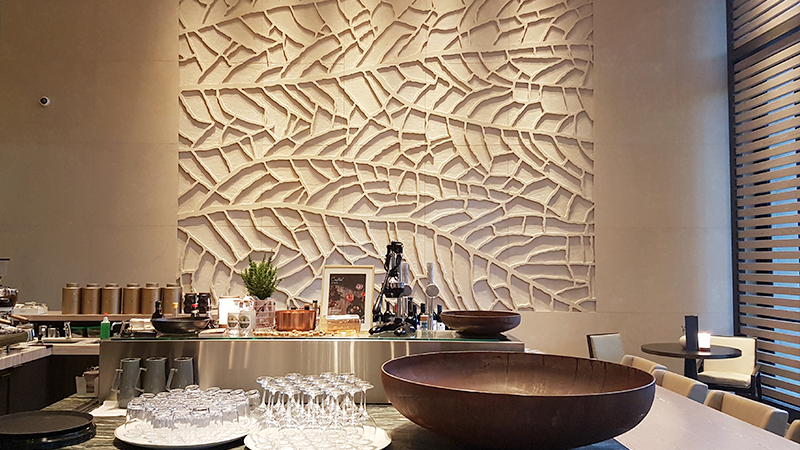 A total of five natural stone panels with different sizes are to be found within the hotel The Westin Perth. Crowded and relevant spaces such as the Lobby bar, the Hall and the main entrance embrace these works of art. A few nice columns made with the natural stone from Bateig decorate some other spaces. The natural stone Bateig panels were designed by different local artists such as Claire Beausein, who has a wide experience in working with handmade paper as traditional and contemporary mean of work; Or Lena Nyadbi, a contemporary Australian indigenous painter from the community of Warmun, in the region of Kimberly in Western Australia. Both of them are inspired by the culture and customs, demographic history of the country, nature and richness of their lands. On the one hand, Claire Beausein is inspired by nature and creates pieces of art which reflect representative elements. On the other hand, Lena Nyadbi is inspired by her own roots and represents spearheads and nearby places where she has lived. These places remind the indigenous and rural community. Natural materials are present in the works of art from both artists. In order to prepare a faithful capture of the artists’ works of art, Bateig made a rigorous work with the numerical control machines. The natural stone chosen for this work of art was Bateig Beig Verona with a sandblasted finishing. 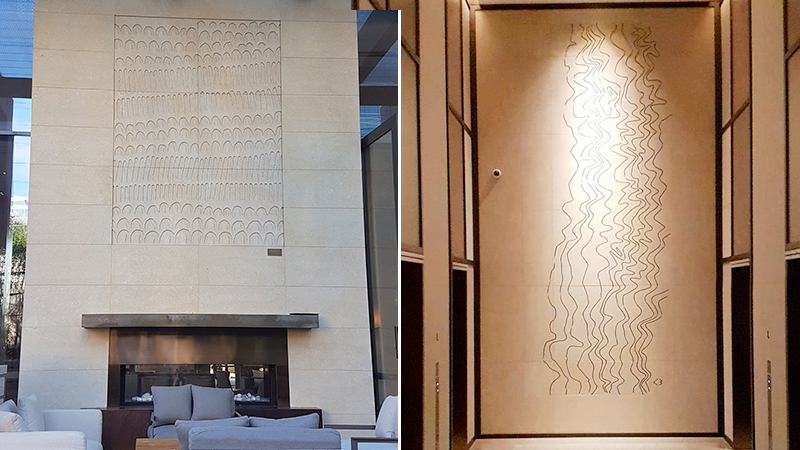 The decorative panels have different sizes, some of them reaching measures of 8 x 4 m. These have been made with different pieces of 1 x 1 m and a thickness of 5 cm creating a final mosaic. Not only the interior panels were made with the natural stone from Bateig, but also the exterior façade. A total of 3.500 m2 of Bateig natural stone were used within the whole façade. We can find different pieces with different measures such as 182 x 50 cm and 150 x 50 cm with a thickness of 3 cm. The company Piedra Ltd was in charge of placing the material. This was a rigorous and delicate process with an excellent result.. In other words, this is a hotel where art has conquered the walls, decorates rooms and embraces panels in natural stone from Bateig. This is the right place to imagine and get in contact with the essence of Perth.